When the gear selector lever is moved to the Drive (D) range from the Neutral (N) position, the transmission will provide engine braking. In this operating range, the normally-low 1234 pressure control solenoid 5 is commanded ON and, in the engine braking mode, the following changes occur within the hydraulic circuits. The manual valve is moved to the Drive (D) position and allows line fluid pressure to enter the drive fluid circuit. Drive fluid is then routed to the clutch select valve, the 1-2- 3-4 clutch regulator valve through orifice #19 and to the 2-6 clutch regulator valve through orifice #22. The 1234 PC solenoid 5 is commanded ON allowing actuator feed limit to enter the PCS 1234 clutch fluid circuit. PCS 1234 clutch fluid is then routed through orifice #20 to the 1-2-3-4 clutch regulator valve, and through orifice #17 to the 1-2-3-4 clutch boost valve. PCS 1234 clutch fluid, at the 1-2-3-4 clutch regulator valve, opposes 1-2-3-4 clutch regulator valve spring force and 1234 clutch feedback fluid pressure to regulate drive fluid pressure into the 1234 clutch fluid circuit. The 1234 clutch fluid is then routed to the 1234 clutch boost valve and through orifice #36 to the 1-2-3-4 clutch. PCS 1234 clutch fluid pressure acts on a differential area, moving the 1234 clutch boost valve against 1234 clutch boost valve spring force, to regulate 1234 clutch fluid into the 1234 clutch feedback circuit. As PCS 1234 clutch fluid pressure is increased to a given value, the 1234 clutch boost valve opens the 1234 clutch feedback circuit to exhaust. This results in the 1234 clutch regulator valve moving to the full feed position, sending full 1234 clutch feed pressure (full line pressure) to the 1-2-3-4 clutch. The 1234 clutch fluid enters the transmission case assembly and moves the 1234 clutch piston against spring force to apply the 1-2-3-4 clutch plates. 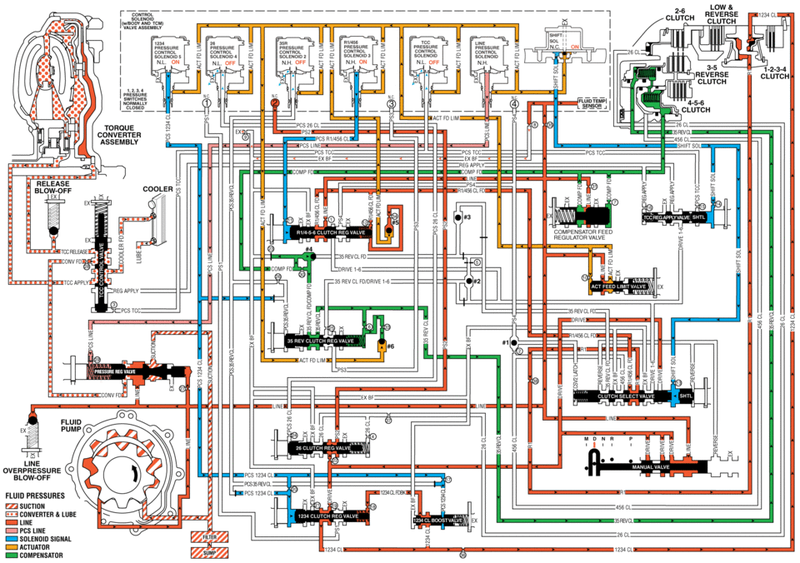 Drive fluid passes through the 2-6 clutch regulator valve into the PS2 circuit. PS2 fluid is routed to the normally-closed #2 pressure switch and opens the switch. Shift solenoid fluid, present at the valve from Park position, continues to hold the clutch select valve against clutch select valve spring force. R1/456 clutch feed fluid, also present at the valve from Park position, continues to pass into the R1 circuit to feed the low and reverse clutch. Drive fluid is present at the valve in preparation for a change of gears. The low and reverse clutch remains applied until just before the 1-2 shift in order to provide engine braking.